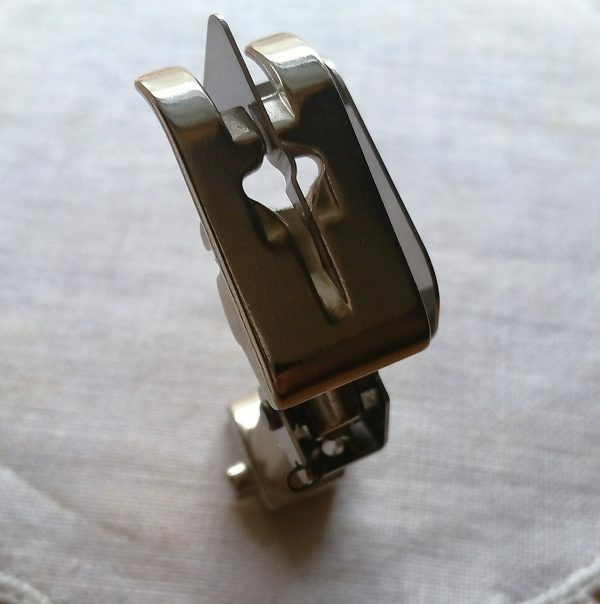 Make quick work of stitching a turned hem with your sewing machine and the Blindstitch foot #5. When I first saw a demonstration of sewing a turned hem with an invisible stitch using the Blindstitch foot #5, I was totally amazed! It was like witchcraft—turn the hem, pin, sew, and it’s stitched before you know it. This is a quick and easy technique to use when finishing any project with a turned hem, and it works with all fabric types. The reasons behind how the Blindstitch foot #5 can sew such a perfect turned hem isn’t really witchcraft! The trick is the center blade extending from in front of the toes clear back through the needle opening. 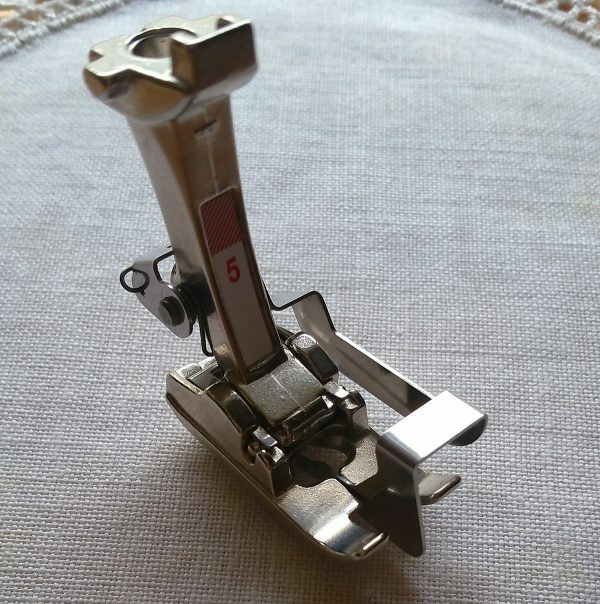 This blade is attached to the foot with a spring that gives and allows it to move when sewing over seams. The blade includes a little curve to make room for the needle, which forms a stitch over the blade as the hem is sewn. As the zigzag stitch is formed over the blade, it will be formed loosely, preventing puckers and tucks in the fabric along the hemline. It’s the perfect tool for the job! 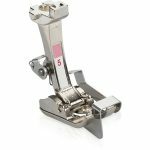 Check out this quick video to see how I use this foot with my B 770 QE to create a quick machine stitched hem. If you haven’t tried this technique yet and are curious (go ahead and try it, you’re going to like it! ), here are a few tips to get you started. First things first, the hem edge of the fabric has to be folded the right way before putting your project under the foot. It took me a few tries to get the hang of it, and if you’re finding this a little tricky try watching this Blindstitch foot #5 video tutorial that includes a quick fabric folding demonstration. 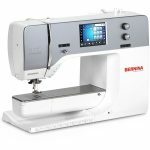 If you are using a thin or lightweight fabric, finish the raw edge with a serged seam, an overcast stitch, or seam tape before sewing the blind hem. If you are creating drapes, curtains, or a heavy skirt that need a thick hemmed edge to give extra weight to the edge for a straight hang, double-fold the raw edge of the fabric before sewing the blind hem. Once you have the hem folded correctly, do a test-run on a scrap of your fabric using the Blindstitch. Check your manual or stitch card to find out how to set your model to sew the Blindstitch. When you make a test sample on your scrap, look closely at the stitch length and width. 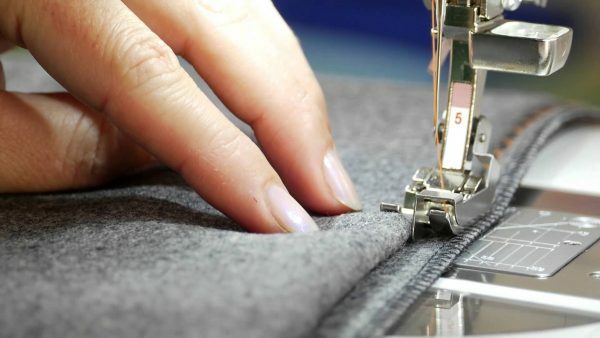 Take a look at the stitch width, or how the tip of the zigzag stitch takes a small bite out of the hem. It should be a solid stitch to hold the hem, but should only look like a teeny tiny stitch from the right side of your stitch sample. If the stitch looks much too large on the right side of the stitch sample, decrease your stitch width and try again. If the stitch isn’t catching enough of the folded fabric to make a secure hem, increase your stitch width and try again. Check the stitch length to see how it performs along the single layer of the hem, and how the zigzag portion of the stitch looks when sewing the folded edge of the hem. 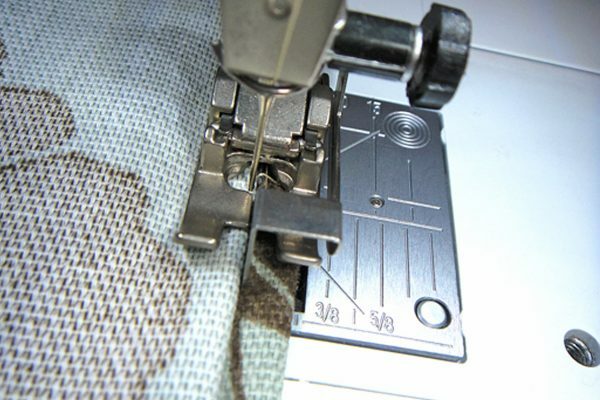 If you are using a very thick fabric or very thin fabric, you may need to adjust the stitch length. The finished sample should feel solidly stitched—if it looks like the fabric wants to gap open or sag in between the zigzags, try decreasing your stitch length. And if it feels like there are just too many zigzags in your stitch sample, try increasing your stitch length. Stitch another sample and check out your results. I hope you’ll give this technique a try to add a simple and quick finish to your next hem! Previous Previous post: Podcasts—The Ideal Sewing Entertainment! Thank you for the video on this foot. However, may I suggest replacing the word witchcraft with the word magic? There is a history there that has caused injury to people, and the word is a somewhat derogatory reference to those who practice the Wiccan religion. Magic or some such neutral word, would be more appropriate in my view. Please consider it. Thank you.